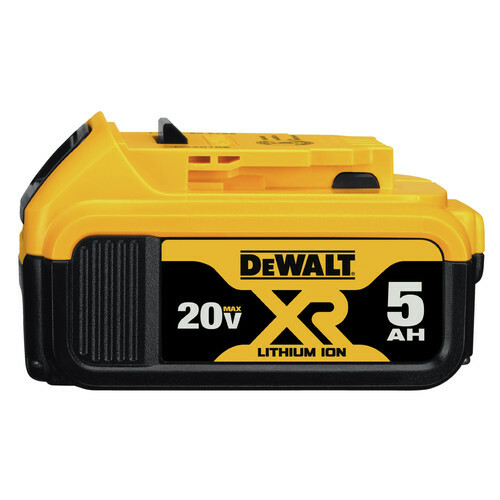 The DeWALT 20V MAX XR Cordless Lithium-Ion 5 in. Band Saw (Bare Tool) features a 5 in. x 4-3/4 in. cutting capacity for making cuts in strut, pipe, angle iron and a variety of other materials. This band saw has an LED work light with a 20 second delay that illuminates dark work surfaces for accurate cutting, and offers a variable speed trigger and dial that allow for versatility and control. LED Work Light with 20 second delay illuminates dark work surfaces for accurate cutting. I've never used a portable band saw, my recip. saw or grinder has done all the cutting I needed. This tool is large but does a great job of yielding clean cuts with out crazy vibration or molten flying metal. I've had this cordless bandsaw for two years. It is EXCELLENT in every specific feature that makes a bandsaw worthy of owning. It is so good that I have almost forgotten I have a DeWalt corded bandsaw in the toolbox. Good, straight cuts, light to carry and handle, excellent battery life, multiple and variable speeds, and ease of changing blades. Best DeWalt tool I own. Great clean cuts for conduit and threaded rod. Almost no reaming required. Saw paired with a 4 mah battery will last several full work days on a single charge. A little heavy but totally worth it. Is there a stand that is compatible with this bandsaw? Can you get a blade to cut through steel or is this just for wood?